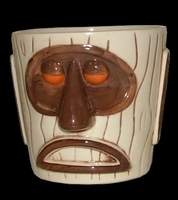 Modern Primitive Tiki Mug/Mai Tai Bucket Tiki Mug Free Shipping. Modern Primitive Tiki Mug/Mai Tai Bucket - Orange Eyes The companion piece to our green eyed variation, we did up what is the most complimentary color to green - orange. This version also measures 3 1/2" in height and holds 11 oz.